As marketers, it’s our job to ensure all the interactions people have with our brands and products are as positive, useful, and memorable as possible. Of course, these change by platform. When you need to find out why your subway is delayed, you might head to Twitter. When you need to know when your local bookstore closes, you might use Google Search. Why does any of this matter? Because we know that consumer needs are far more powerful than other indicators that marketers use, such as demographics. That’s why when I was given the chance to talk with YouTube’s Josh Lewandowski, I jumped at it. 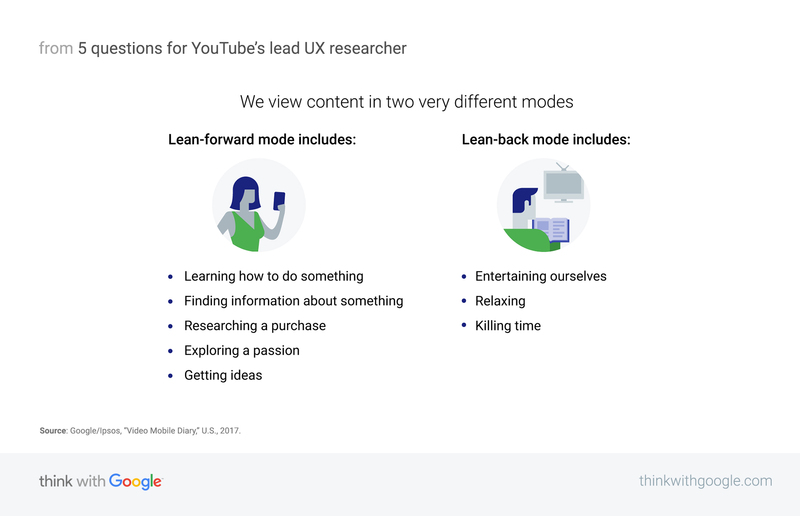 As the lead user experience (UX) researcher on the platform’s main app, he has a deep understanding of why users head to YouTube, what they expect when they get there, and what that means for brands looking to grab their attention. Josh Lewandowski: On any given day, I’m trying to answer one of two questions: What are the desires, needs, and problems our users have that we should be anticipating? And once we know what those are, what’s the best way to solve for them? To answer those questions, I’m constantly doing both qualitative and quantitative research—everything from talking to users and watching them use YouTube in their homes, to carrying out lab studies to see if people use our products the way we expect them to. Source: 2and2/Google, “The Values of YouTube” Study, (n of 1,006 consumers between the ages of 18-54, with 918 monthly YouTube users). Respondents were asked to choose which platforms they turn to for a range of needs, Oct. 2017. These needs can show up in broad or specific ways. Someone might come to YouTube knowing exactly what they’re looking for—to listen to a particular version of a song, say. Others come to browse. They know roughly what they want—to get caught up on the latest news, for example—but they’re not looking for one video in particular. On YouTube, we’re now seeing more browsing than searching behavior. In fact, as our recommendation algorithms keep getting better, we’re now seeing more browsing than searching behavior. People are choosing to do less work and let us serve them. 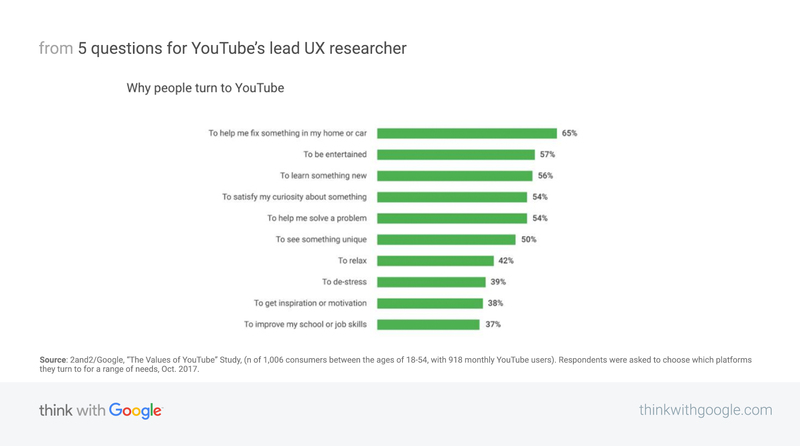 What’s new in the world of user engagement and behavior on YouTube? We’re seeing this direct form of co-creation more and more now, especially with our new community tab. Creators will use this to routinely ask fans what type of content they want to see, what their favorite videos are, and where they should go next. These examples might not seem especially relevant for marketers, but I think they speak to a broader change in user behavior: people are no longer satisfied with just passively consuming content, they also want rich interactions. Adding interactive features such as polling, live chat, and video infocards, because it has helped make video viewing a more active, engaging experience. Source: Google/Ipsos, “Video Mobile Diary,” U.S., 2017. We’re really starting to focus on user satisfaction as a measure of success for product development, ads, and even our algorithms. If what we're doing makes users happier, we're on the right track. And directly asking users “What’s your biggest frustration today?” and “What’s your favorite thing about YouTube?” provides more insights than we could gather from watch time alone.